Viggo Mortensen has it all. The right amount of mysticism, the classic hunky looks and the major movie parts. But when he's not on the big screen he's a shy, artistic soul who would rather spend his time with his son and his ex-wife. Vecko-Revyn met him in Los Angeles. Viggo Mortensen is shy. He finds it embarrassing to be a celebrity, and he avoids publicity when he can. Viggo threw himself into the work and toiled harder than anyone else. He says that he wanted to live like his character Aragorn, to really feel at home in the part. He then says that he doesn't mind being a bit like the parts he is doing, but that he enjoys being an artist where he is doing the creating. Viggo is a hippie from head to toe. He prefers to walk barefoot, and talks about love, peace and understanding, the universe and other major things. What you might not know is that he's published several books with poetry, photos and paintings. His love of the outdoors life comes from his summers spent in Denmark. One of the things Viggo does not like to talk about is the fact that he is rated as one of the most attractive single men in the world. The ex-wife is Exene Cervenka - artist, musician and singer in punk band X. The couple have a son; 14-year-old Henry. 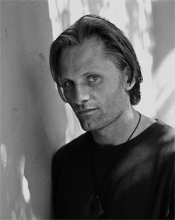 Viggo has been listed among the most attractive men in the world several times and surely has no problem meeting girls. If he wants to, that is. He squirms uneasily. The talk about girls and his looks has him making a face that clearly shows he thinks women are a slightly uncomfortable topic of discussion.